While the Americans (and other nationalities of the world) may relish waking up to the aroma of coffee, there is no doubt that the British prefer sipping a hot cup of tea in the morning (and mayhap other parts of the day). I love coffee, I am not denying that, but there are times when I simply need tea as my drink for the day. One of my favorites is the English Breakfast Tea, which I can drink at any time of the day. What is this tea anyway? 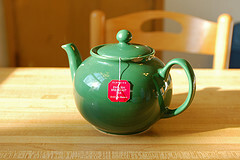 The English Breakfast Tea is usually a blend of different black teas. The blend may consist of teas coming from areas such as India, Sri Lanka, Kenya, Malawi and China. The fact is that the English Breakfast Tea was first invented in Edinburgh, Scotland by a man named Drysdale, a well known tea master. His idea was to market the blend under the label Breakfast. The rest is history. It is a robust, full-bodied beverage with light floral undertones (sometimes referred to as “coppery”). When blended with milk, it produces a comforting aroma eerily similar to warm toast and honey. And as we know, the olfactory receptors in our noses are responsible for 80% of what we perceive as flavor. Indeed, English breakfast tea can give you a warm fuzzy feeling just as you brush away the cobwebs of sleep in the early morning. Why not have a cup today?